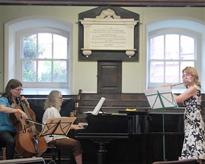 Live music ensemble - piano, wind and string trio - classical music and more for weddings, parties and events in Norwich, Norfolk and East Anglia. To zoom in press ctrl and '+' in all modern browsers. Below you can listen to examples of music which we might play at a wedding, party or event. © Copright 2010 Dexterity Trio.